I bought the bag a year and a half ago, feb 2017. After less than a year the retractable handle would not retract after extending. I called bowling.com and they sent a replacement handle. Kudos to them. Installed the new handle, and after 6 months of use, the new handle will not extend. I took it apart and the button that you press to allow the handle to retract or collapse quit working. It only activates one side or deactivates one side of the pins that hold the handle in place when collapsed or extended, thus rendering the bag worthless. 2 handles broke in a year an a half. I am a sporadic bowler, so it has not been close to being used as much as a league bowler would use it. Does it come with a sholder strap? Hello. Unfortunately, this roller does not come with a shoulder strap. The picture shows a large storage compartment with rolling thunder on it. Does the opposite side also have a storage compartment? Unfortunately this bag does not have full length side pockets on both sides. It has the one fill length pocket and then a smaller accessory pocket on the top of the bag. This along with the large shoe pocket should provide a lot of storage room for all your accessory needs. What is the weight of the bag and does the platinum protection cover damage due to baggige handlers at the airport? The Platinum Protection will cover anything that the limited manufacturer warranty wouldn't cover. This bag will be about 32 pounds when filled. It can hold up to a size 15 in mens shoes. It can hold two small pair. Will this bag fit in a standard locker? Yes, it should fit in a locker. 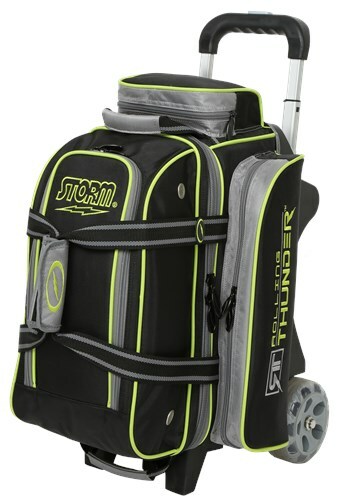 Due to the time it takes to produce the Storm Rolling Thunder 2 Ball Roller Black/Grey/Lime ball it will ship in immediately. We cannot ship this ball outside the United States.